Aristocrat Leisure Limited (ASX:ALL) diversified its exposure beyond gaming machines with its acquisition of social casino business Product Madness and the internet gaming system and remote game server from GameAccount Network. Revenue generated by the business increased from under US$15 million in FY12 to US$354 million in the 12 months to March 2018, however there is some concern with a slowing of revenue growth. Revenue generated by the business increased from under US$15 million in FY12 to US$354 million in the 12 months to March 2018. This transformed the business such that is generated EBITDA of around US$145 million in the 12 months to March 2018, albeit before an estimated US$25 million of Design and Development costs. That’s a pretty good return on a A$32m investment. Aristocrat significantly stepped up its bet in the online space this time last year with the acquisitions of social games developer Plarium for US$350 million followed by US based social casino and social games platform Big Fish. Outside of an acquisition in 2014, these were the largest acquisitions ever undertaken by Aristocrat. The social casino and social gaming markets are growing and evolving rapidly. At its investor day in May, Aristocrat estimated the size of the two markets globally: the social casino market US$4.5 billion; and the social gaming market is US$45.9 billion. This is expected to grow by 13 per cent a year over the next three years to around US$73 billion making it as large as the overall console and PC gaming markets globally. 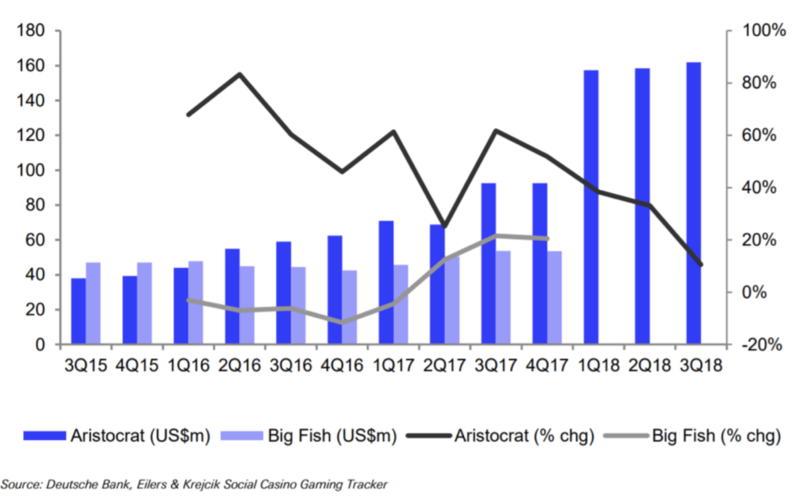 Aristocrat has a significantly stronger position in the social casino market with combined proforma revenue of US$622 million for the 12 months to September 2018, up 27.7 per cent on the 12 months to September 2017 according to Eilers & Krejcik Social Casino Gaming Tracker. This suggests Aristocrat has around 13-14 per cent of the overall global market, and is the clear number two player behind industry leader Playtika. Of some concern was the slowing of revenue growth in the six months to September 2018 to 20.8 per cent, as compared to the 36 per cent growth generated in the six months to March 2018, with the three months to September growing just 10.6 per cent primarily as a result of slowing growth from Product Madness. However, the slowdown appears to have been felt across the industry with Aristocrat maintaining share in the period. Encouragingly, industry revenue growth has reportedly recovered in September and October. In social gaming, Aristocrat is a very small fish in a very large pond (pardon the pun). With proforma revenue of around US$550 million in the 12 months to March 2018, the company has just over 1 per cent of the global market. Aristocrat is minnow in this market behind established players like Activision and Tencent. It appears revenue has been largely flat in this part of the business over the last six months as mature legacy games like Vikings and Gummy Drop are rolling over and the company releases new games that are very immature. While the social gaming space provides Aristocrat with an enormous amount of upside, the business will require a significant increase in investment to broaden its portfolio across the various categories in the market. This is likely to see earnings and margins weaken in the near term for this business. Success in the part of the market is far more uncertain than in the social gaming space given the company’s weaker position, and far more limited value add in terms of content, but the potential growth upside is also far greater in the long term. The digital businesses offer the company material earnings growth potential that could drive the company’s overall earnings growth as the earnings from its core land based gaming business begin to peak on the back of its current significant product advantage. However, there is also far greater uncertainty regarding the company’s success in this market given the immature and rapid evolution of the market and the popularity of individual games with consumers.